Audinate has reported that 300 manufacturers have now adopted Dante, the Audio-over-IP networking solution, and that more than 750 Dante-enabled products are now available worldwide. To celebrate these milestones, Audinate will bring back its #DanteEverywhere contest at InfoComm 2016, giving attendees the chance to win a variety of prizes by finding Dante partners exhibiting at the show. 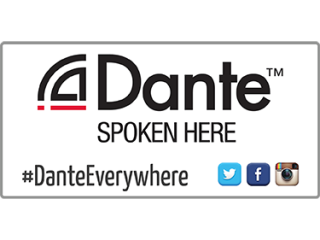 To participate, attendees just need to take photos of the ‘Dante Spoken Here’ signs at any of the over 90 Dante partner booths and post them to Twitter, Facebook, or Instagram using the hashtag #DanteEverywhere. Participants posting the most pictures each day will win Bose QuietComfort 20 Acoustic Noise Cancelling headphones, and everyone who enters will win a Dante T-shirt. Get more information and a map of the Dante licensees at the Audinate booth #C11529, or at their website. In the Audinate booth, attendees can also experience several new features that are being added to Dante Controller, Audinate’s network management software. The soon-to-be released Device Lock features a PIN-based system for locking and unlocking devices on a Dante network. Other features in the upcoming release of Dante Controller include control via Wi-Fi and extended device filtering to better navigate larger Dante implementations. Audinate will also demonstrate Dante Via in its booth, located at C11529 in the Central Hall. The Dante Via software application makes it possible to network any computer-based audio, including USB, FireWire and Thunderbolt devices, and audio applications.